Seven prefects of Ratu Kadavulevu School yesterday met Prime Minister Voreqe Bainimarama over the future of suspended principal Peni Senikarawa. Mr Bainimarama encouraged the young leaders to help maintain and uphold the discipline and reputation of the school while they wait for the Ministry of Educa­tion to complete the process of investiga­tion. He also reassured them that he had direct­ed the Ministry for Education to swiften the process of the investigation so as to bring stability to the current dilemma. The prefects led by the two deputy head boys and two house captains had appealed for Mr Senikarawa’s reinstatement. Mr Senikarawa was stood down pending investigations into allegations that he used corporal punishment on some students. 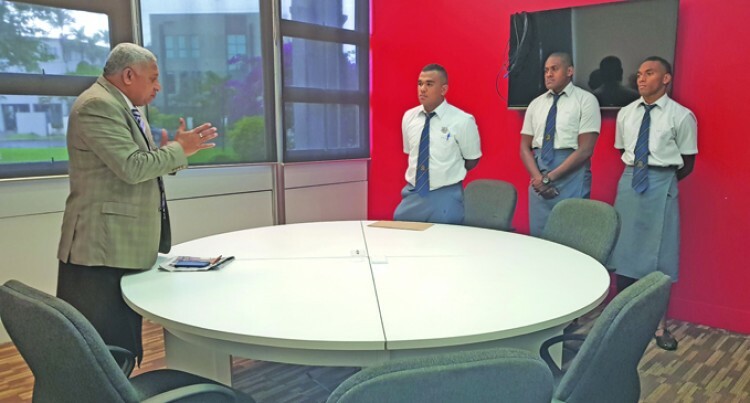 The prefects made a special trip to Suva at their own expenses to meet Mr Bainimara­ma in his office. It is understood the headboy was preparing for a major examination and could not make the trip. The students refused to comment when ap­proached. However, it is understood, the students’ plea was based on the school’s academic and sports achievements under Mr Seni­karawa’s leadership. In sports, RKS won the Fiji Secondary School Rugby Competition, 2018 Coca-Cola Boys’ Championship, Rugby League after 21 years and the Sanix Rugby World Youth Tournament in Japan. The achievements were part of Mr Seni­karawa’s five-year development plan. Mr Senikarawa went to RKS from Tailevu North College in 2015. He is a former student and has been hailed for instilling discipline and restoring pride into the school. “He has lifted the school to a new level with the school’s academic results and sporting achievements,” said a source close to the students. “His commitment and loyalty to the school was shown when he paid his own way to cheer for the RKS Under-18 rugby side at the Sanix World Youth Tournament in Japan. “RKS became the first Fijian school to win the title, thrashing New Zealand’s Hastings Boys High School 35-5. Mr Senikarawa received his letter of sus­pension from the Director Education during the opening of the Legal Aid Office in Koro­vou, Tailevu, in March this year. The case was referred to the Police. After their investigations the file was forwarded to the Office of the Director of Public Pros­ecutions. The ODPP said in a statement yesterday that a decision would be made shortly. The case goes back to a few months ago when a group of students allegedly attacked a teacher verbally. The teacher had allegedly tried to stop them from vandalising a wall in one of the school buildings. It is understood Mr Senikarawa tried to discipline the group by allegedly adminis­tering corporal punishment. One of the students reported the incident to his mother, who then lodged a complaint with the Ministry of Education which re­ferred the matter to the Police. Mr Senikarawa retires next year when he turns 55.